Electric Loco shed Lallaguda was constructed as a part of Vijayawada – Balharshah Railway Electrification project at a cost of Rs. 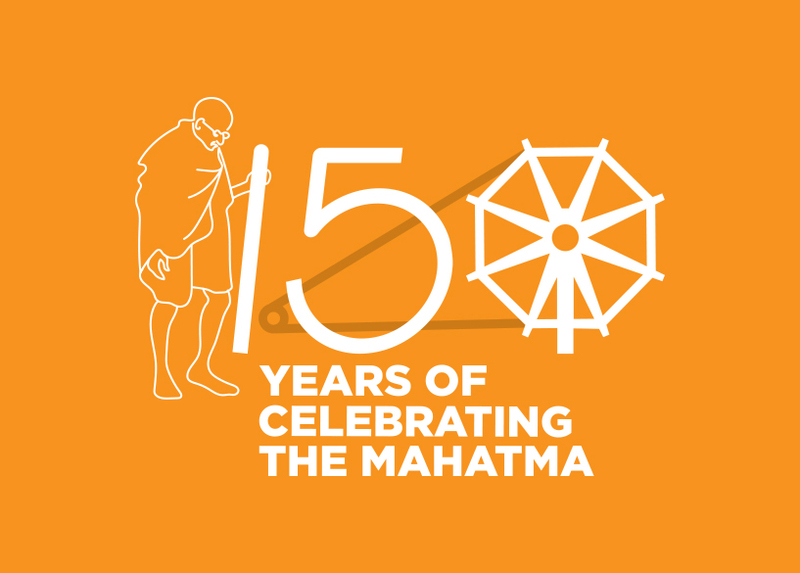 25 crore including the Machinery & Plant with a designed homing capacity of 100 Locos. The shed was inaugurated on 06.09.1995. The shed has started with initial holding of 72 Locomotives comprising of WAM4 & WAG5 for hauling Passenger and Goods Trains.Over the period however composition has changed based on traffic requirement. ELS/LGD carries out Minor maintenance schedule (IA/IB/IC/IT) and Major Maintenance Schedules (AOH/MOH/IOH) as well as unscheduled repairs of locos. POH of Locos is carried out at Bhusawal & Perambur Loco workshops. 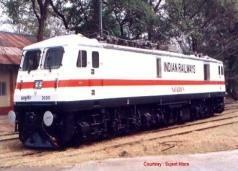 During the month of November-2010, the total loco failures of ELS/LGD over Indian Railways were reduced to 26. 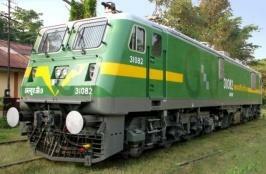 It is the best figure achieved since inception of 3-Phase locomotives. To avoid the failure of Traction motor due to breakage of bellow plate, a modified arrangement has been suggested by ELS/LGD which has now been approved by RDSO. Electric Loco shed, Lallaguda received “Best Electric Loco Shed Shield” for the year 2010 among the three sheds in SC Railway. Quality audit on failures has been carried out as per the Head quarters instructions and remedial measures has been initiated. The frequency of cleaning of radiators of 3phase locomotives has been increased to every schedule instead of alternate schedule. Special drive has been conducted on CBC coupling locos and the same is conveyed to safety branch of SC Division. 3phase locomotives received from CLW were identified to have a type defect in the labyrinth assembly of traction motor bearing. The labyrinth was made of mild steel and later on of cast iron with clearance of 0.5 mm. This was causing the rubbing of the two surfaces leading to seizure of traction motor. Now the material of labyrinths assembly has been changed to SGCI and clearance has been improved to 1.5 mm. With a view to ensure eco friendly disposal of scrap, (i.e., rubber items, cotton waste etc.,) an incinerator plant of 50Kgs/hr capacity has been installed & commissioned. This plant was inaugurated by CEE/SC on 28th Dec’10. 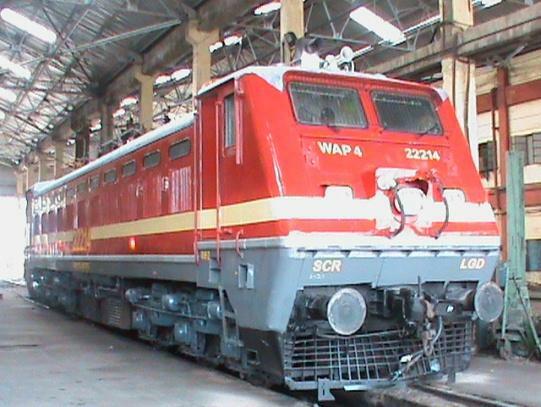 To facilitate comfort of the Driver, Air Conditioning arrangement has been provided in two CABs of WAP7 locomotive and the loco is turned out on 24th Aug’10. The performance of this equipment is reported satisfactory. This is the first time any shed has provided Air Conditioner in a locomotive cab. To improve the appearance and durability of painting of locomotive, use of Polyurethane (PU) painting has been recommended. ELS/LGD has taken the initiative and has planned PU painting of WAP4 locomotives during major schedules through outside agency. In the month of February-2011, Goods outage has been 70.5 locos per day as against the target of 59.34 locos, i.e 18.8% above the target, which is the highest ever achieved. The ovality of commutators Hitachi Traction Motor was noticed to be increasing within a service period of 06 months. The excess ovality cause high rate of wear on carbon brushes and subsequent flashing. Such motors had to be withdrawn prematurely before they are due for overhauling i.e., 18 months. To overcome this problem, shed has made an attempt to correct the ovality in situ. 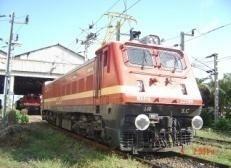 This has result into saving of loco hours as well as cost of man power.